PHILADELPHIA, PA – OCTOBER 6, 2016 – Janney Montgomery Scott (“Janney”), a leading full-service wealth management, financial services and investment banking firm, is pleased to announced the hiring of Tyler Hill, who joins Janney’s Institutional Equity sales team in Boston, MA as Managing Director. 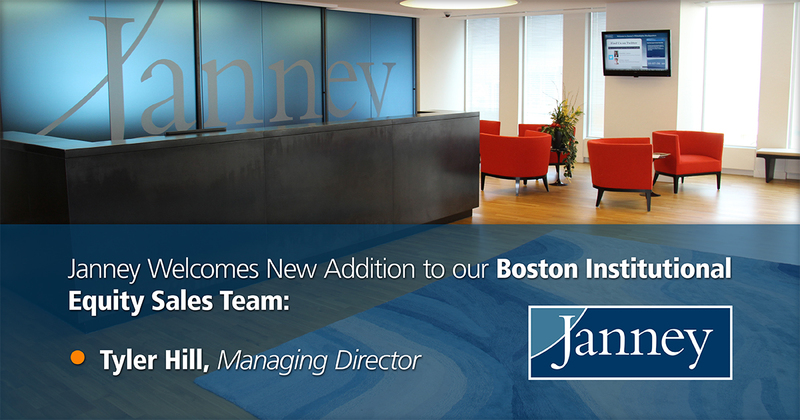 Mr. Hill joins Janney with over 15 years of industry experience. Mr. Hill spent the last 9 years at Wedbush Securities as a senior salesperson covering key institutional accounts in Boston. Prior to Wedbush, Tyler was a sector specialist at Fidelity Investments on their Financials research team. While at Fidelity, he worked with analysts and portfolio managers to help support their fundamental research efforts including conducting primary company specific research, industry research, and making stock recommendations. He started his career as a pension fund consultant at New England Pension Fund Consultants (NEPC). Mr. Hill has an undergraduate degree from Franklin & Marshall College.